One facet of our “new economic reality” (what will it be called someday – the Great Collapse?) that warrants some thinking about is the emotional/spiritual side of this kind of loss. It’s been less than six months since the market took its historic plunge and the bailouts began, and most of us have been in a “wait and see” mode. But lately, I am hearing more and more about the repercussions of having the rug pulled out from under one – whether from young people who are about to graduate from college or from older ones who have seen their retirement money suddenly reduced by half. Click here to read the rest of this post on Kelli’s blog at www.ourlocallife.com. We in the US who say we believe in social justice must challenge ourselves to look at the world through the eyes of those who have much less than us. Why? Social justice, as defined by John Rawls, respects basic individual liberty and economic improvement. But social justice also insists that liberty, opportunity, income, wealth and the other social bases of self-respect are to be distributed equally unless an unequal distribution is to everyone’s advantage and any inequalities are arranged so they are open to all. Therefore, we must educate ourselves and others about how liberty, opportunity, income and wealth are actually distributed in our country and in our world. Examining the following can help us realize how much we have to learn about social justice. 1. How many deaths are there worldwide each year due to acts of terrorism? 2. How many deaths are there worldwide each day due to poverty and malnutrition? A: About 25,000 people die every day of hunger or hunger-related causes, according to the United Nations. Poverty.com – Hunger and World Poverty. Every day, almost 16,000 children die from hunger-related causes – one child every five seconds. Bread for the World. Hunger Facts: International. A: Today’s average CEO from a Fortune 500 company makes 364 times an average worker’s pay and over 70 times the pay of a four-star Army general. Executive Excess 2007, page 7, jointly published by Institute for Policy Studies and United for Fair Economy, August 29, 2007. The 1965 numbers from State of Working America 2004-2005, Economic Policy Institute. A: Calculated in real (inflation-adjusted) dollars, the 1968 minimum wage would have been $9.83 in 2007 dollars. Andrew Tobias, January 16, 2008. The federal minimum wage is $6.55 per hour effective July 24, 2008, and will be $7.25 per hour effective July 24, 2009. A: True. The USA spends $43.4 billion on pet food annually. Source: American Pet Products Manufacturers Association Inc. The USA spent $23.5 billion in official foreign aid in 2006. The US government gave the most of any country in the world in actual dollars. As a percentage of gross national income, the US came in second to last among OECD donor countries and ranked number 20 at 0.18 percent behind Sweden at 1.02 percent and other countries such as Norway, Netherlands, Ireland, United Kingdom, Austria, France, Germany, Spain, Canada, New Zealand, Japan and others. This does not count private donations, which, if included, may move the US up as high as sixth. The Index of Global Philanthropy 2008, pages 15-19. A: The World Bank reported in August 2008 that 2.6 billion people consume less than $2 a day. A: Worldwide, 1.6 billion people do not have electricity and 2.5 billion people use wood, charcoal or animal dung for cooking. United Nations Human Development Report 2007/2008, pages 44-45. A: People in the US lead the world in meat consumption at 42 kg per person per year, compared to 1.6 kg in India and 5.9 kg in China. People in the US consume five times the grain (wheat, rice, rye, barley, etc.) as people in India, three times as much as people in China, and twice as much as people in Europe. “THE BLAME GAME: Who is behind the world food price crisis,” Oakland Institute, July 2008. 10. How many cars does China have for every 1,000 drivers? India? The US? A: China has nine cars for every 1,000 drivers. India has 11 cars for every 1,000 drivers. The US has 1,114 cars for every 1,000 drivers. Iain Carson and Vijay V. Vaitheeswaran, “Zoom: The Global Race to Fuel the Car of the Future” (2007). 11. How much grain is needed to fill an SUV tank with ethanol? A: The grain needed to fill an SUV tank with ethanol could feed a hungry person for a year. Lester Brown, CNN.Money.com, August 16, 2006. 12. According to The Wall Street Journal, the richest one percent of Americans earns what percent of the nation’s adjusted gross income? Five percent? Ten percent? Fifteen percent? Twenty percent? A: “According to the figures, the richest one percent reported 22 percent of the nation’s total adjusted gross income in 2006. That is up from 21.2 percent a year earlier, and it is the highest in the 19 years that the IRS has kept strictly comparable figures. The 1988 level was 15.2 percent. Earlier IRS data show the last year the share of income belonging to the top one percent was at such a high level as it was in 2006 was in 1929, but changes in measuring income make a precise comparison difficult.” Jesse Drucker, “Richest Americans See Their Income Share Grow,” Wall Street Journal, July 23, 2008, page A3. A: HUD reports nearly one in four people in homeless shelters are children 17 or younger. Page iv, the 2007 HUD Annual Homeless Report to Congress. A: Over 100,000 veterans are homeless on any given night. About 18 percent of the adult homeless population are veterans. Page 32, the 2007 HUD Homeless Report. This is about the same population as Green Bay, Wisconsin. 16. The military budget of the United States in 2008 is the largest in the world at $623 billion per year. How much larger is the US military budget than that of China, the second-largest in the world? A: The US military budget of $623 billion is larger than the budgets of all the countries in the rest of the world put together. The total global military budget of the rest of the world is $500 billion. Russia’s military budget is $50 billion, South Koreas is $21 billion, and Irons is $4.3 billion. GlobalSecurity.org. 18. Over the 28-year history of the Berlin Wall, 287 people perished trying to cross it. How many people have died in the last four years trying to cross the border between Arizona and Mexico? A: At least 1,268 people have died along the border of Arizona and Mexico since 2004. The Arizona Daily Star keeps track of the reported deaths along the state border, and it reports 214 died in 2004; 241 in 2005, 216 in 2006, 237 in 2007, and 116 as of July 31, 2008. These numbers do not include deaths along the California or Texas borders. The Border Patrol reported that 400 people died in fiscal 2206-2007, while 453 died in 2004-2005 and 494 died in 2004-2005. Source The Associated Press, November 8, 2007. 19. India is ranked second in the world in gun ownership with four guns per 100 people. China is third with third firearms per 100 people. Which country is first and how widespread is gun ownership? A: The US is first in gun ownership worldwide with 90 guns for every 100 citizens. Laura MacInnis, “US most armed country with 90 guns per 100 people.” Reuters, August 28, 2007. A: The US jails 751 inmates per 100,000 people, the highest rate in the world. Russia is second with 627 per 100,000. England’s rate is 151, Germany’s is 88 and Japan’s is 63. The US has 2.3 million people behind bars, more than any country in the world. Adam Liptak, “Inmate Count in US Dwarfs Other Nations'” New York Times, April 23, 2008. OPINION: What’s Wrong with Jeremiah Wright? Now that a little of the furor over the sound bites from Rev. Jeremiah Wright’s sermons and his recent interviews has died down, I can’t help wondering what’s wrong with Wright. 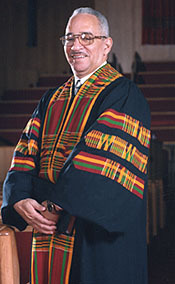 Some of his more inflammatory assertions – that the U.S. government could have introduced the HIV/AIDS virus and drugs into the black community, that we are the most violent nation in the world, that our country was built on the genocide of its indigenous people, and that our foreign policy was linked to the 9/11 attacks – are hard to swallow for many of us. Where is this man coming from? Listening to his two-part interview with Bill Moyers (part one, part two) in its entirety and watching his interview with the National Press Club are helpful in understanding the context in which these statements were made. Moyers gives some background on Wright’s most controversial statements and respectfully gives him the opportunity to respond. Wright’s speech before the National Press Club was equally thoughtful and enlightening, although, in contrast to Moyers, the facilitator at the NPC was not only less respectful, but sometimes downright antagonistic. This did not bring out the best in Wright, who came off as being combative and arrogant during the question and answer period. The two of them together sometimes behaved like they were participating in a high school debate, smirking when they thought they made a point smartly. This part was a little painful to watch. But the content of Wright’s remarks shouldn’t be ignored because some of us are put off by his oratorical style. He uses the cadence and fist-shaking accusations of the prophetic, “woe unto you”-style of preaching reminiscent of the Hebrew prophets. It’s not unlike some of Martin Luther King Jr.’s truth-telling sermons and speeches and brings to mind the style and delivery of a number of African-American preachers on any given Sunday. It’s troubling that charges of divisiveness by the mainstream press – and by Obama supporters afraid of the political fallout – are muffling the crux of what he’s saying. He’s an articulate, intelligent, well-educated person who has lived out many years shepherding a church in an extremely impoverished neighborhood in Chicago. He’s walked the walk – hearing and seeing how racial injustice has affected the people he loves, seeking to inspire them to rise above and claim their own share in the American Dream, expressing his and their disillusionment and – yes – anger over how very much more difficult it is for some than for others. Yes, he’s offensive to some ears, as surely Jesus was to those whom he called a brood of vipers or whose tables he kicked over in the marketplace. But if we can get past the discomfort and drop the knee-jerk offense at the impoliteness of it all, it becomes clearer that he’s calling it as he sees it, as a good pastor, activist, and reformer should – and that he may be seeing some things most of us miss. To say he should be criticized for his lack of patriotism, shunned for being “divisive,” or quieted down for being animated and angry about the underbelly of U.S. policy and its effect on folks with dark skin, is to attempt to shut up an articulate voice in the multiple narratives that tell the complicated story of who we are as a people and that might help us move forward in a new way. The story of our country looks different to a Native American and will include a history of genocide and immoral land acquisition and its long-ranging repercussions. The story of an African-American embodies enslavement and long-term racism and its continued effects on the hopes and dreams of young black children. The mother of an addict will read differently the historically documented information regarding U.S. foreign policy in Central America and its effects on the drug trade. And the families of the black men who died thinking they were being treated for syphillus while they were actually being treated like lab rats, will feel differently when they read news stories about illnesses affecting a disproportionate number of black folks. Wright speaks of these narratives and embodies the anger at injustice of a people he loves and for whom he feels a responsibility as pastor and brother. The only ones who benefit from everyone playing nice – not mentioning the elephant in the room or the naked emperor on parade – are those in league with the oppressors, standing to gain from the status quo, or not wanting to be ruffled by the messiness of historical reality. Those of us who hope for change need to sit still and listen to folks like Reverend Wright – even if it makes us uncomfortable. There’s not much wrong with what Reverend Wright has to say. As many of you know, issues around providing care to homeless people in our community are being brought constantly to the city commission. St. Francis House, our local homeless shelter, received flack for years about the “undesirables” that were attracted downtown because they were offered help there. Restrictions were enforced, and SFH began limiting the number of people who were served. Next, a “one-stop center” was proposed and approved as a way to care for those restricted from SFH, but no one wanted the center near them, and it took a while to find a place (and now to get funding). Churches stepped up to fill the gap (and respond to their calling to be “good news to the poor”) by opening their doors to people in need – offering friendship, food, and sometimes shelter. And now that is being threatened. Currently on the agenda for the city commission is discussion on how to limit, and sometimes restrict, churches from offering food and shelter to the poor and/or homeless. Donna Lawson, director of the Interfaith Hospitality Network – an organization that assists churches in offering food and temporary housing to homeless families – has attended recent commission meetings and gives a synopsis in a letter she wrote (below). She also offers a very compelling analysis of the attitude that allows this to happen (in bold). The Community Development Committee meeting went quite badly last night. It is obvious that City Staff and Commissioners are intent upon placing additional restrictions on congregations, both as regards to lot size as well as feeding hungry persons and sheltering homeless persons. The meeting ended without Commissioners Henry, Lowe and Donovan voting on all issues raised. Indeed, after four hours of meeting, we didn’t even finish the discussion about shelter provision, nor did we discuss the issue of feeding hungry persons. Here are notes on the discussions, action taken, and direction City Staff are moving Commissioners toward. This is a requirement for larger lot size than is currently in Code. It should be noted that, according to City Staff data, there are currently 21 congregations in the City on lot sizes smaller than 1 acre. All but three of these are in Single Family Districts. All but six of these are on the East side of town. Restrictions as envisioned by Commissioners at this meeting will hurt the ability of small congregations wishing to develop, e.g., those with memberships of less than 100. Though City staff repeatedly assured the audience that the new restrictions would not hurt existing congregations in their ability to renovate their current buildings, there was disagreement among City staff about the process and whether or not congregations would be forced to obtain special permissions/permits for certain renovations. 2. Sheltering Homeless Persons – (Except where noted, sheltering restrictions apply across the City, not just in RSF Districts.) Discussion got bogged down, as Commissioners tried to anticipate all possible problems and issues that could arise and that could be legislated. It appears that Commissioners may place congregations sheltering on a temporary basis – such as IHN-participating congregations – in a separate category than congregations wishing to shelter on a more permanent basis. However discussion ended for the night with no vote on the issues. Commissioners did begin discussing creating additional restrictions for congregations wishing to house people on a “permanent” basis. For example, they discussed the possibility of allowing congregations sheltering on a permanent basis to shelter only 3 families or 3 unrelated persons, rather than the maximum of twenty people currently allowed in the code. City staff recommended that restrictions on hours of operation be removed for congregation-based shelter activities. They also removed from their recommendations the restriction for “compatability with the neighborhood in RSF districts,” because they are recommending to Commissioners that all sheltering taking place inside (i.e., congregations could not allow persons to sleep in tents on congregation property).There was no discussion of the requirement that congregations obtain a permit for sheltering homeless persons. Commissioner Donovan has requested that this issue be addressed before the Ordinance is returned to the Commission. 3. Food Distribution to the Needy – (Except where noted, restrictions on food distribution apply across the City, not just in RSF Districts.) Commissioners did not yet discuss this issue. Back-up documentation provided indicates that City staff have revised their recommendations and are now recommending that hours of operation be restricted to 7:00 a.m. to 8:00 p.m. Similar to shelter activities, if food distribution takes place indoors there would be no “compatability requirements” in RSF districts. If food distribution takes place outdoors, there would be compatability requirements in RSF districts.Staff have not re-addressed the following issues: limit of 20 meals served/day, quarter-mile separation between congregations providing food, no-feed zone around the University. Back-up documentation indicates that they want time to survey other communities.What was most discouraging about the meeting was its tenor. The meeting began with the discussion of lot size for congregations, which only affects Residential Single Family Districts. Numerous members of several neighborhood groups were present at the CDC meeting to argue in support of restrictions. There seemed to be general consensus – including among Commissioners – that the presence of a congregation in a neighborhood portends problems due to increased traffic, traffic throughout the day as a congregation grows, lighting, and so on. There was also the insinuation from the audience that congregations will withhold information or give false information about congregation size or plans for growth in order to worm their way into a neighborhood or to obtain permits, etc. There was no disavowal of this statement by Commissioners. Additionally, as the discussion moved toward sheltering and feeding, the discussion shifted to the effect of housing “those people” in a church, with statements that homeless persons come with so many problems that there must laws in place to protect congregations from themselves or the community from congregation efforts to help too many homeless persons at one time.I was ashamed of my community last night, at least the members who think they can and should legislate against all “possible potential problems” that might occur when people of faith show compassion to the poor and needy among us. I brought up the fact that we allow laws already on the books to regulate behavior such as that which occurs downtown each weekend. Though police officers report that there are shootings and stabbings every weekend in downtown Gainesville, related to the bar activity, we do not shut down bars on weekends to prevent people from shooting or stabbing each other. Additionally, bars and restaurants downtown are allowed to serve hundreds of people, and to serve until late into the evening. Yet in an attempt to prevent whatever behavior they believe will be exhibited at churches by hungry and homeless persons, Commissioners and City staff want to allow only a very few of each to be served by congregations. Though a bar can serve 100 people up until 2:0 0 a.m., the church next door can provide food to only 20 hungry people and must stop doing so by 8:00 p.m. Though several bars in the same block can serve 100 people each, two churches next door to each other cannot both feed hungry people. There’s something really, really wrong with this. Personally I think the issue is money – people who patronize bars and restaurants spend money; people who own bars and restaurants make money. Hungry and homeless people do not have money and therefore do not have influence.